Dr. Swail Pirzada received her optometry degree from Pacific University College of Optometry in Forest Grove, Oregon. She also obtained a Bachelor of Science degree from the University of British Columbia with combined major in science. During optometry school, she focused on treatment and management of ocular disease and practiced at different clinics and hospitals throughout the United States. She has worked as an intern at Legacy Emanuel Hospital (Portland, OR), Veterans Affairs Hospital (Fresno, CA), Nationwide Vision Medical Center (Mesa, Arizona) and Image Optometry (Surrey, BC). She was also a part of the Beta Sigma Kappa society, Canadian Association of Optometry Students and National Optometric Student Association. 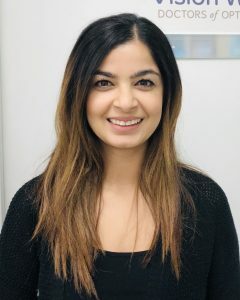 Dr. Pirzada has a passion to provide the best possible eye care to the public while continuing her professional development as an optometrist. She has many strong leadership and communication skills with the desire to help others. She is fluent in English, Urdu and Punjabi which allows her to be able to communicate with a variety of patients.